Here we are, at the end of August. Late summer is always a strange time for me, s0 melancholy on the one hand, and on the other hand is the fact that autumn is my favorite season, and I can’t help but greet it with excitement. This is an odd time of year for many of us, I think; nearly everyone I’ve spoken to in the last week has expressed disbelief and mixed emotion that Labor Day is around the corner. Life as a graduate student puts the transition from summer to fall into a particularly stark relief. Returning to class means once again feeling stretched between work and school, between my life as a student and my much richer life as a professional. That the last few months have been so reflective makes it even harder to swallow the idea of returning to the academic grind, the rigor and discipline of the sciences. In other words, I’m dreading the semester. What’s interesting, though, is that I’m talking about this dread, rather than trying to pretend it isn’t there. One of the many realizations I’ve come to in the last few months is that it’s time for me to take a more honest posture about graduate school and its tug on my life. For the first time, I can admit that more often than not school is a source of drudgery–worthy drudgery, for sure, but drudgery nonetheless. Last year, I found myself assuming the identity I often cling to, which is that of a good girl, a model student, a perfectionist who must constantly reassure everyone around her that she’s not only rising to meet every challenge, but liking the process, too. That I’d been through the great med school rejection only a year earlier didn’t help; if anything, it made me a little too eager to prove that I could dive back into academia and emerge redeemed. I can’t really blame myself. It’s what I’ve always done: presented with a task or an assignment, I aim to perform optimally before asking myself how that performance will impact my happiness. I convince myself and others that I’m enjoying the work, when the truth is that I often feel trapped, caught in a cycle of striving that takes on a life of its own. Meanwhile, I let languish the things that give me true fulfillment, like writing, reading, cooking, and creating. My post-bacc was the most obvious example of this pattern, but it’s one I stumble into again and again, and I suspect that it’s all tied to an unfortunate and, let’s face it, cliched desire to prove my own worth. This isn’t to say that the things I’m striving at don’t have value. Annoyingly, they do. My post-bacc was one of the most important and worthy experiences of my life, though not in the way I expected. And my current studies, while draining, have given me information and training that makes me better at my work and more confident in doing it. So there’s that: the frustration of trudging through an experience whose rewards and meaning will probably only be discernible after the fact. This was a summer of self-exploration. Instead of taking the familiar, well-traveled road of striving, I tried a different road instead, one that encouraged me to slow down, step back, and detach a little. Amazing things have happened: I’ve started listening to music and reading poetry again. I’ve gotten back into cooking, not as something I do professionally (even if that’s true), but as an expression of curiosity and creativity and the longing for self-care. I’ve even started to dream once in a while, or rather to remember dreams, which is something I haven’t been able to do in years. The numbness is wearing off. Silly though it may sound, I feel as though I’m waking up, or coming home, or maybe both. Of course this process doesn’t have to be at odds with going back to school, with August ending or September beginning. That’s ridiculous, I know. That’s just how it feels, because school has come to symbolize something that’s so much bigger than the thing itself. Now the challenge is for me to resist ascribing too much meaning to the simple act of returning to class, to take what I’ve learned and carry it with me as the seasons change. My therapist had some reassuring words to offer me about all of this: she noted that I’m returning to school with a “different toolkit” than the one I was carrying before. It was such a comforting idea, this notion that I’m toting around a new sack of habits, ideas, and intentions. We can never control what happens to us, and we can’t control how we feel about it, either–not really. We can only experience the feelings and learn to greet them with patience and trust. A toolkit stays with us no matter what challenges or obstacles life presents us with. It’s ours to use whenever we need it, until the day comes when we don’t need it anymore, or we need a different set of tools instead. So, I tell myself that I have the tools I need to greet this transition with grace. Above all, I’m determined to approach the semester with honesty, which is to say that I’m not interested in swallowing my feelings or pretending to feel things I don’t. I’m not looking forward to school–that’s the truth. And I don’t intend to prioritize it above everything else, or to give it any more time or attention than is necessary. It’ll just be another thing I do, and it’ll probably be the thing that I’m least interested in talking about. Maybe my feelings will shift at some point, as they often do. In the meantime, I’m learning the power of authenticity, of putting into words what I truly feel, and only that. As I sat down to pull together my weekend reading links this morning, I was struck with a source of unexpected comfort: changes in the academic calendar might be unambiguous, but changes in the natural world are not. It’s the very end of August, but tomatoes and peaches and corn will be ripe all through September, and I was still able to buy local berries this past week (which you’ll see in a recipe very soon). Seasons seem to change gently at the farmers’ market, and I love this. It means never having to say goodbye to an ingredient too quickly, too soon. On the list of summery produce that’s here to stay–at least for a while–is zucchini. 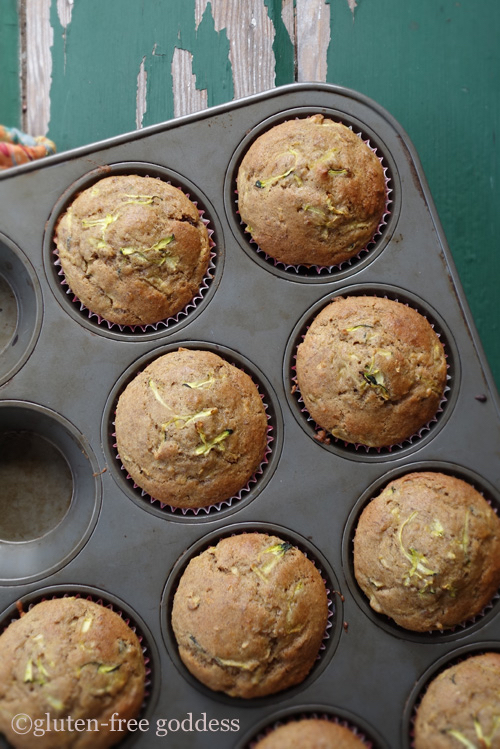 And there’s nothing I’d rather do with it than make Karina’s lovely zucchini flax muffins, which are both gluten free and easy to veganize (she lists an egg replacer option in the recipe instructions). Look at the perfect rise of those golden tops! 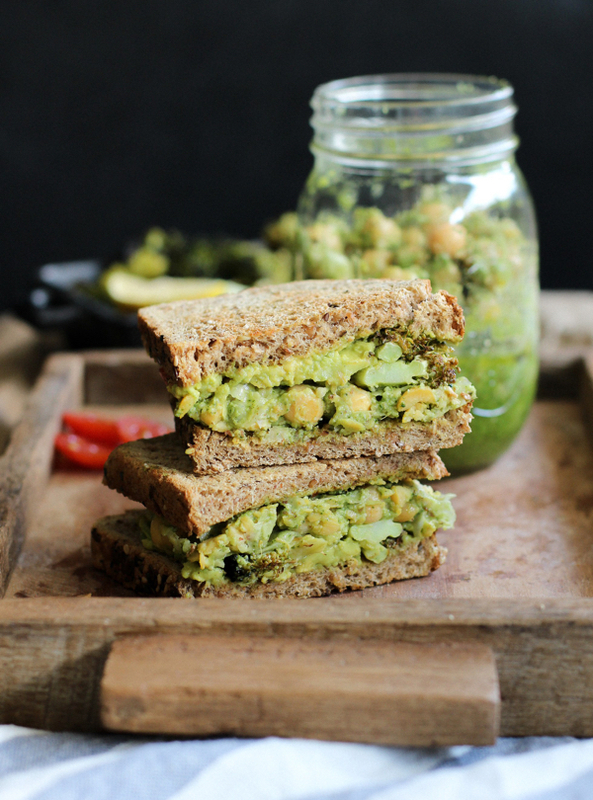 Molly’s pesto chickpea sandwich is perfect summery lunch fare, and I love that she adds roasted broccoli to the sandwiches for extra heft and green goodness. Can’t wait to try these. 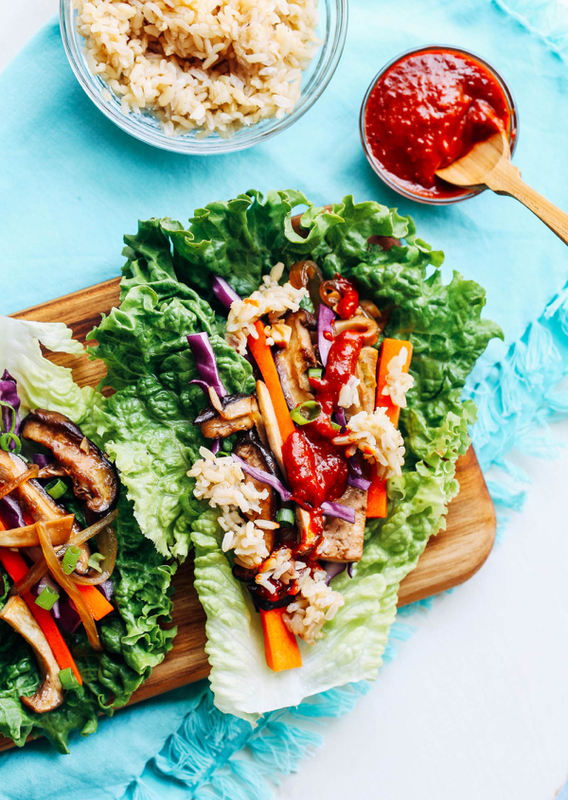 I’m in awe of Sarah’s bright, bold, and colorful bulgogi lettuce wraps. A lot of summer lettuce wraps are pretty to look at, but not quite filling enough to tide me over. These look both hearty and fresh, not to mention pleasantly spicy. I had a conversation a few years ago with one of my Food52 editors about how to veganize Cheeze-Its, and while I remember having a few ideas, I never got around to trying it. 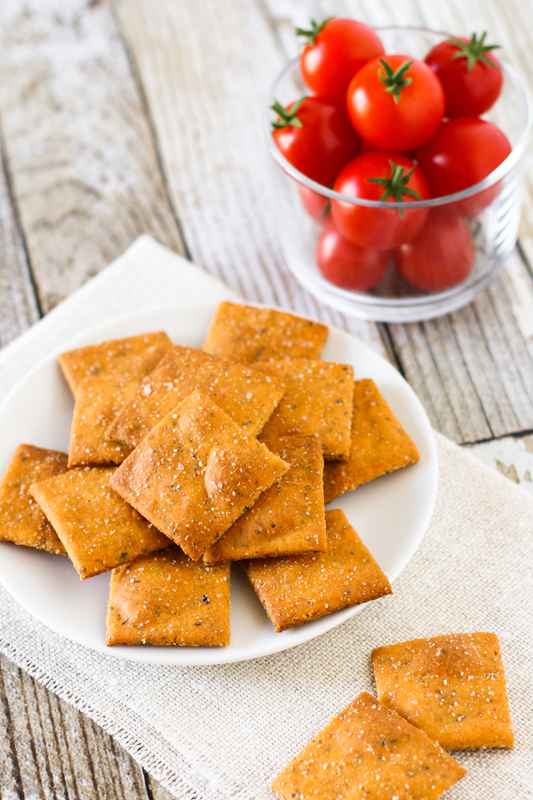 Now I don’t need to, because Sarah has created vegan and gluten free pizza crackers that are both cheesy and packed with herbs. Yum! 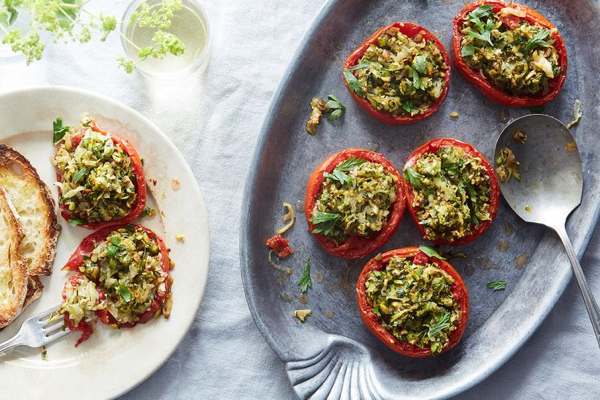 I was particularly struck by this recipe for Moroccan stuffed tomatoes, full of fresh herbs, zucchini, and pistachio nuts. I’ve never had great luck with stuffing tomatoes, but maybe this recipe will be the game-changer? 1. I linked to one of Jamie Varon’s articles last week, and this week she posted something else I thought I’d share, which is an unusual meditation on the idea of self-love. “Self-love” is one of those things that’s nearly impossible to write about because so much has already been said, and the terrain is littered with cliches. I’m not sure I have a definition, except that I know it’s not quite the blissful romance that it’s often made out to be (a topic that I’ve tried to tackle before, here and here). Who, in the end, can say what self-love is or isn’t: surely that’s something that can only be known and felt with one’s own heart. But I like any attempt to write about self-love and self-care with honesty and individualism. 2. My work has given me the privilege of crossing paths with many men and women who are on healing journeys from chronic illness. The affliction I’ve spent most time around is inflammatory bowel disease–Crohn’s Disease and ulcerative colitis–mostly because I spent two years working in a GI’s office. I know, to whatever extent an outsider can ever really know or understand, the toll that this condition can take. So, I was excited to see this article about American olympic swimmer Kathleen Baker, who was diagnosed with Crohn’s at the age of 12 and has sustained her career as an athlete in spite of the fact that she needs to train in a way that allows her to remain well. Baker notes that many parents of kids with Crohn’s have reached out to her recently, describing their struggles, and she expresses hope that her story might give all people with Crohn’s and their families a sense of possibility and hope. 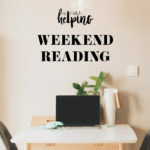 When you’ve struggled with chronic illness, the very idea of competing in the olympics might sound impossible; oftentimes, regaining the capacity to move through everyday tasks is its own healing triumph. But I’m happy that Baker’s story is out there, and I so admire how she has modified her training schedule (one practice per day, which is a sacrifice for an olympic athlete) in order to respect and care for her body. 3. I was really touched by this article, which reports on a study in which human participants lied in order protect the feelings of robots who had a capacity for facial expression. The study subjects were given a chance to perform an activity–cooking, actually–with one of three versions of a robot, Bert. …would communicate with the chef by asking questions such as “Are you ready for the egg?” But when it tried to help, it would drop the egg and reacted with a sad face in which its eyes widened and the corners of its mouth were pulled downwards. It then tried to make up for the fumble by apologising and telling the human that it would try again. Once the omelette had been made this third Bert asked the human chef if it could have a job in the kitchen. Participants in the trial said they feared that the robot would become sad again if they said no. One of the participants lied to the robot to protect its feelings, while another said they felt emotionally blackmailed. 15 of the 21 participants said that they’d choose to work with the third Bert again if given the chance, in spite of his errors. Perhaps they all felt “emotionally blackmailed,” but it’s also possible that the humans connected with the idea of fallibility and remorse; after all, aren’t those emotions we all feel every day? We like the idea of perfection, but we don’t connect to it, because it’s not something that any of us have experienced. What we know is that messing up, facing our errors, and asking for forgiveness and understanding are an integral part of the human experience, and they–far more than optimal performance–connect us to each other. An optimistic interpretation, maybe, but I’m sticking with it. 4. Speaking of going off script, this is a lovely article about the role that humor and empathy can play in medicine, even if those capacities aren’t necessarily encouraged in medical training. And it discusses improv classes for doctors as a training ground in which these qualities can be encouraged. What a cool idea. 5. Finally, I wanted to share this article about recipe development from Amanda Hesser, if only because I think it captures succinctly what so many of us food lovers experience as we use and create recipes of our own. On the one hand, there’s the desire to make food that’s simple and intuitive, to avoid fussiness and unnecessary detail. On the other hand, there’s an awareness that sometimes small details–breaking out the microplane grater in order to add lemon zest to something, turning on the oven on a hot summer’s day to roast vegetables when pan sautéing would be faster, taking the time to marinate something, sourcing a specialty ingredient–actually do make a recipe that much stronger. This is a dilemma I’ve come up against repeatedly this summer as I test cookbook recipes: my desire to create simple, accessible food sometimes vies with my impulse to add a step or two if I suspect it’ll amount to better flavor. There’s no easy answer, but most of the time I try to dwell in the middle, being unafraid to call for extra effort if I think it’s really worthwhile, but not if I don’t. That’s essentially the same conclusion that Amanda comes to in her blog post–and while you’re reading, the salad recipe is pretty great, too! On that note, I’m headed off to savor the last Sunday of this August. Thanks as always for reading, and I’ll see you soon. Step by step, with the Herculean effort of one foot in front of the other in full reflection, we will make it. Because on the other side are more than goals: they’re the ethos that we strive to embody. The compassion and respect we wish to embody – for others and for ourselves. It may be an indirect road, but some value may be in the journey. All the best this upcoming semester! May your tools be of value, and may you give yourself permission to use them. Thank you so much, Katie. I could not agree more that there is value — maybe all of the value — in the journey. What kind words about the post–thank you, Maria! I respectfully disagree on both as they haven’t been my experience. They were when I didn’t realize that I had choice, so I unconsciously went through life letting life choose for me and feeling like no matter what I said, did, or thought nothing would change. I slept-walk through my life, so it was no wonder I felt a victim and kept re-creating the same scenarios and wondering what was wrong with me. A tool I added to my toolbox is reframing. No way could I know all that went into an experience. I couldn’t read minds, so I’d write scenarios of how I thought people felt and why they did why they – and I – did what we did. That’s life happening to you. Reframing allows me to step into the other’s shoes and get a sense of what is or was going on with that person. Maybe it wasn’t about me. Maybe that person was having a bad year that day, but I took it all on. Bad me. If only I could get it right, be more perfect, more whatever I wasn’t and less of whatever I was that I thought was faulty. I’m not a complete master at this healing and manifesting what I want yet, but I’ve woken up enough to be able to co-create better outcomes. And it starts with me. And the path gets revealed as I keep going on it. I don’t have to figure it all out myself. Or be perfect. Gena, I have utmost respect for you and the choices you are making – and sharing – in your world. You are doing a magnificent job and being a beacon through this rapidly changing, seemingly chaotic world that we are changing, one step at a time, one thought at a time, one heart at a time. Gopika, I’m moved and inspired by this generous comment–thank you. I love the idea of reframing as one of those tools that allows us greater freedom, agency, and perspective, and I look forward to meditating on the idea. Thank you for sharing it with me (and everyone!). Good luck with back to school!!! Sounds like you have the perfect outlook going in this time! Thanks so much, B! Happy fall to you. I feel like while the blogging world has become increasungly guarded and inauthentic, your blog has increasingly blossomed and inspired. Thank you for writing the very best thing I read every week! And I will be thinking of you during this upcoming semester. I hope it can somehow get a little easier for you, but if not, I hope it passes quickly! This is what I appreciate so much about you- thank you for this post and your willingness to be transparent. Being honest with ourselves requires so much slowing down and it can be so uncomfortable, but so necessary in order to be truly authentic. I wish we could be real life friends. 🙂 And also wishing you the very best start to the new semester despite the drudgery of it all.